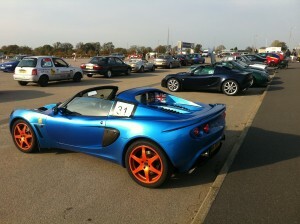 Hosted by the Oxford Motor Club, the Autumn Autosolo was first run in 2008, with a move the Silverstone where it has been held since in 2009. I competed for the first time in this event back in May, when SELOC members were kindly invited to participate. I have to firstly say that I have nothing to compare this event to, but on both occasions, these events were run extremely well and efficiently. The setting is full of motorsport heritage, being held in the large car parks just beside the main entrance to the circuit proudly displaying the ‘Silverstone’ name and you could never forget where you are, as the cars / bikes running trackside can be heard ‘on song’ throughout the day. My day started by setting off from South Manchester at around 6:00am, but at this time on a Sunday morning the traffic is very light, with no need to make use of the M6 Toll road in order to get to Silverstone for the 8am start time. On arrival the car got a quick once over by the scrutineers, who check the basics like MOT, Tax disc and that the car is in a good general condition. Next came sign on, where you are issued your time card and car numbers which need to be displayed on each side of the car. After a short safety briefing at 9:00am we were away. There was a maximum field of entrants of 60 cars for the day, which were split into 3 groups, defined by colour and these were then used to determine whether you (1) Drove (2) Prepared to drive or (3) Marshalled. A marshalling stint is compulsory for each Course and gives the perfect opportunity to learn the course layout a bit better and observe how others drive the course, as well as comparing notes with the other marshals on your post. The day comprised of 4 course layouts, each run 3 times, with the best two times for each Course being used to calculate your cumulative total for the day. All production engined Elise run in the same Class (D), the Production Sports Car up to 1800cc and there was a respectable turnout of 10 Lotus’s out of a total 18 cars in class – the remainder of which was comprised of MGFs, MX5s and a Reliant Scimiter. After Course 1, only 1 second separated first to fourth places, now that is close racing! Course 2 was a disaster for me as I had a quick but costly spin on the first run (I blame cold tyres, but it was probably due to a heavy right foot) and then incurred a 5 second penalty on my second run for clipping a number marker on a cone with my wing mirror just 2 meters from the finishing line! However my third run was within 5 tenths off the fastest time for that course, which showed at least that I had pace, but needed to work on getting more consistent times on the board. Course 3 was respectable for me, but the experience of the seasoned veterans started to show in the cumulative times. I was now third in Class and the gap had now grown to thirteen seconds between the top 4 places in Class, but I was now locked in my own little battle with Theron who was challenging me for third place and only 4 tenths separated us. So it was all down to the Course 4 runs. With the bit between my teeth I put in good clean times, which were within 1 second of the Class winners (Merlin’s) time, so I was happy and just managed to hold on to third place in Class and 5th Overall. Thanks to Theron for the competition again. I remember it was very close between us back in May. The day finished just after 5pm and with only a 20minute break for lunch it is a full days motorsport for £36, with no time to just stand around. I’m now left with the desire to start to compete on a more regular basis to improve my consistency and hopefully in time start to challenge the top of Class. The overall victory was taken by a Subaru Impreza, but congratulations and commiserations must go to Merlin in his S1 Elise who drove near faultlessly and was in line to take the overall win, but sadly just missed out by only 3 tenths of a second after collecting a time penalty for hitting a cone on Course 4, but this was still good enough to take the win in Class D.
SELOC would like to thank Oxford Motor Club for organising this event and inviting our members to compete.